Feb 2009 - Valentines Day. From our base in Nakuru it was an easy drive up the tarmac road to Baringo and then into Kampi ya Samaki. Be warned that some parts of the road have big holes and river crossings. However, the water is not there and its easy to keep on going. In the rainy season, it would be a lot harder. 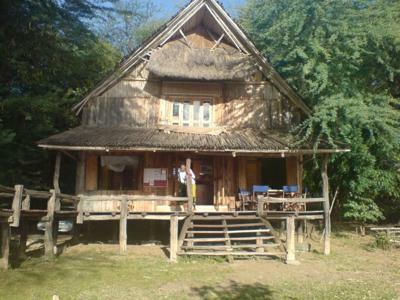 Roberts Camp at the fresh water Lake Baringo is a jewel, a delight and a safe haven. Camping or lodging at their wonderful site is a joy and it was for me and my fiance. In fact we even discussed our future wedding plans there. It's that kind of place, peaceful, full of atmosphere and essentially Kenya. Our stay at HammerKop Lodge was full of wonder and excitement, during the day we wandered the grounds, at night it was different as hippos came to graze the grass and pot plants. It was recommended that we did not go out in darkness. The visitors book was full of excellent comments and yes, I did add mine. A great experience and one for all travellers. Lots of space to erect tents and if you need the comfort then make sure you book a lodge. Hi Archie, it must have been fantastic to watch those hippos in the dark... Never have had the privilige myself, but I hope to do so one day! Once your wedding takes place, there's a popular section at this site about Kenyan weddings that's visited by many people who're planning a wedding in Kenya themselves. I'm sure they're interested to read about your experiences there!